Custom Made Toddler Braclet with Engraved Name Plate. Perfect Gift For Many Occasions. Such a beautiful Chain Link. Very Hard to come by these days. This was a custom made toddler's bracelet. 14k Yellow Gold with a plate, ready to be engraved, as the center piece. The baby's name was engraved on the plate and it was given as a gift for her Baptism. The family was extremely happy and the cute kid can wear it for years to come. Just Contact us for inquiries. Black Tahitian Pearl Ring. 12mm Pearl affixed on a Ring with Beautiful Filigree Design with Round and Marquis Diamonds. Made of 18k White Gold. Pay Close Attention to Detail in Each Picture. 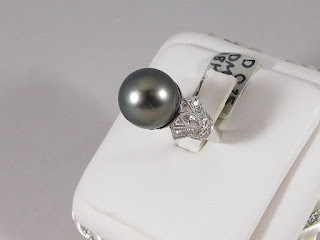 This Tahitian Pearl is very Special. It is called a Peacock Pearl because of the Greens & Purples seen in the Lustrous Gray. 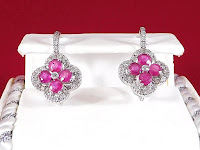 Beautiful Ruby Earrings. Very Special Parcel of Ruby. Amazing Color. Accented with Diamonds. Clip Earrings with Pave Set Diamonds. 4 Amazing Quality Rubies are Set in The Center with a small Bezel Set Diamond in the Middle. 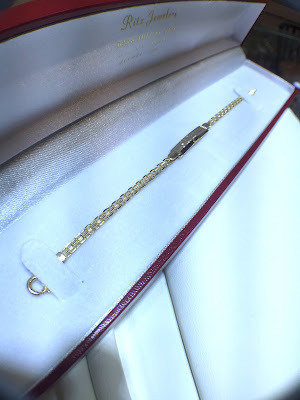 Such an Elegant Piece and Perfect as a Gift for Almost Any Occassion. Loose Tanzanite Ready for a Custom Piece of Jewelry Here We have 2 Loose Tanzanites. Such a Beautiful Stone with many Different Hues. The Smaller Stone is 2.82 Carat Tanzanite and the Larger is 6.60 Carats. Each can be set in a Ring, Pendant, Bracelet, or Most Any Custom Design Your Heart Designs. All Types of Religious Necklaces Available. Happy 4th From Our Family to Yours.